Ok, so there is something you should know about me and home organizing. I love to be organized. Unfortunately, I’m bad at it. Ask Steve. He will be happy to tell you all day long, no doubt. I’m that bad. Luckily, there are some amazing bloggers who are good at it, so those of us who were not born with the organizing gene and are still in training can try to get it together. I actually think getting your kitchen organized might be more important than any other room. After all, we spend a lot of time there, and otherwise boring chores could be made into enjoyable activities if we aren’t stumbling over clutter and searching for the lemon juice. 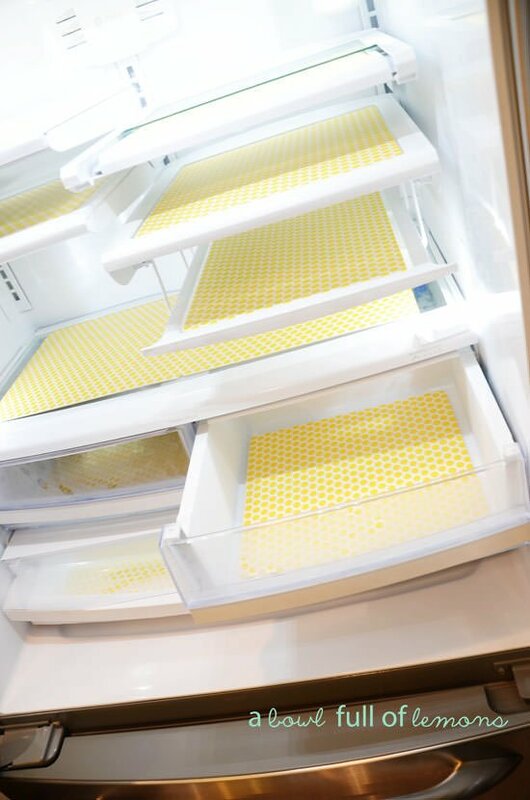 So after researching through the blogosphere, I can share with you these 7 steps to an organized fridge, so that at least one part of our homes can operate like a finely tuned machine. 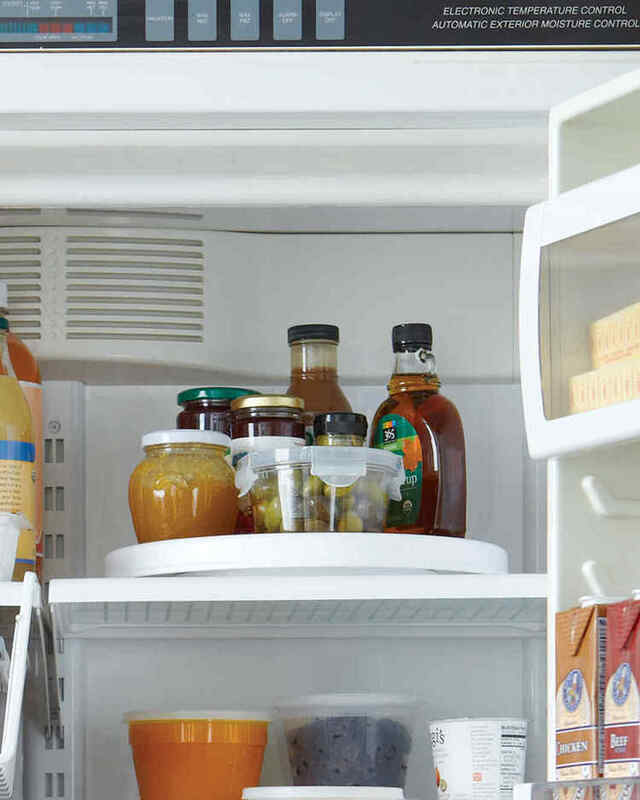 First things first… if you are wanting an organized refrigerator, chances are it has a clutter problem right now. 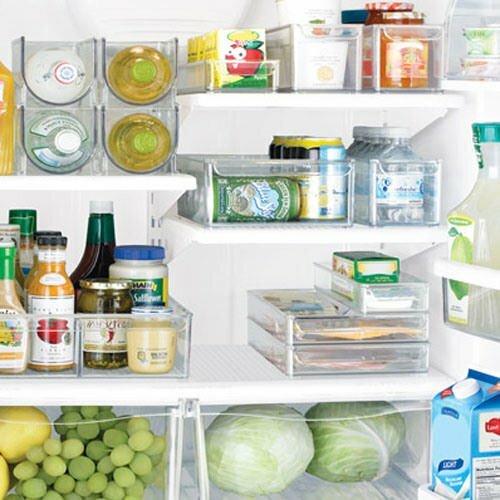 Use these tips from ‘All You‘ to cut the fridge clutter! And be serious about it… let’s face it, no one is ever gonna use that outdated salad dressing you brought home from your vacation three years ago. Visit ‘A Bowl Full of Lemons‘ to find out how to get these great fridge shelf liners. These would be perfect for catching those inevitable juice spills and jelly smears. Anyone else wonder how jelly gets out of the jar, inside the fridge? Jessica from ‘Four Generations, One Roof‘ recommends using containers for everything in there organized fridge. Look how perfect hers looks! I think it would be even easier to organize this way, because you actually have a certain place for a certain thing. I really love how the kids’ snacks are at their eye level… Genius! Also, again another great soda rack / organizer. 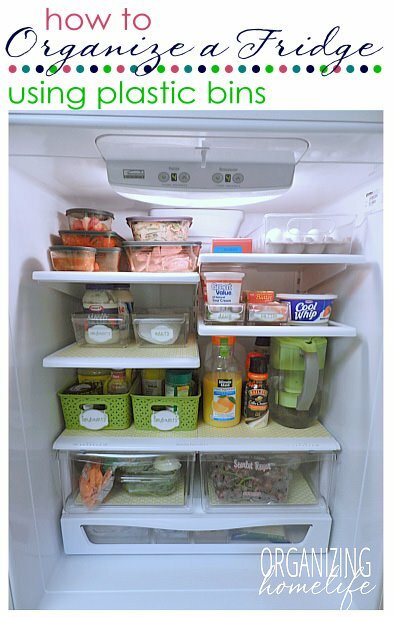 Ginny at ‘Organizing Home Life‘ has the exact same theory… find out how to use bins for an organized fridge at her post, where she shares what has worked for her. The labels are important, I think. Otherwise you will be the only one putting anything where it belongs! From ‘Martha‘, you have to have a lazy Susan in your fridge. Take all those condiments out of the door and put them on the turntable, then move all those bulky juice containers to the door. Voila! Organized refrigerator! 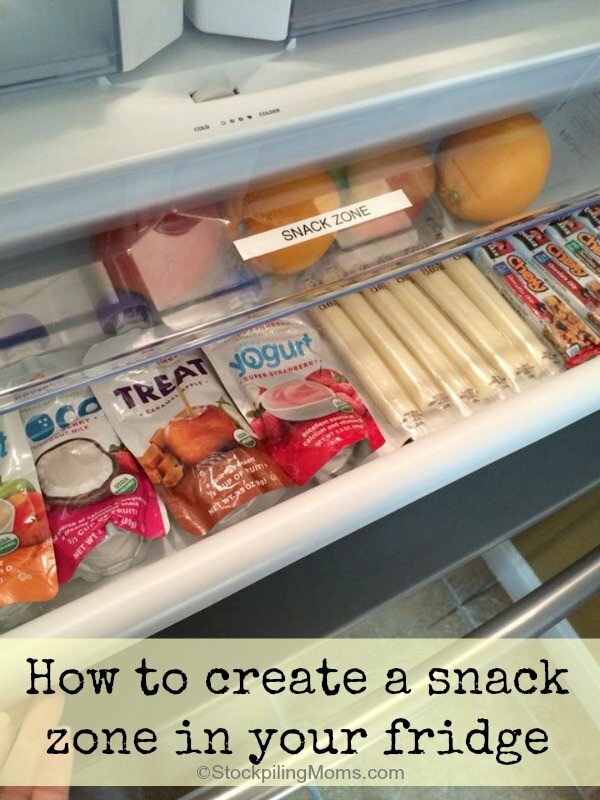 Create a snack zone, to keep the kids from tearing apart your nicely organized fridge each day! ‘Stockpiling Moms‘ created this zone by labeling it for the kids. Great way to keep your Costco buys from disappearing overnight! ‘Little Penelope Lane‘ has the same idea in creating a snack zone, combined with using the plastic bins. Love these healthy snacks! Here is a bin system from ‘Crate and Barrel‘. Notice the soda bin in this organized refrigerator. Pretty easy to get an organized fridge, eh? Ok, off to the store for some plastic bins… and maybe some trash bags. Last time I cleaned out my freezer there was a tenderloin from 4 years ago! True story! 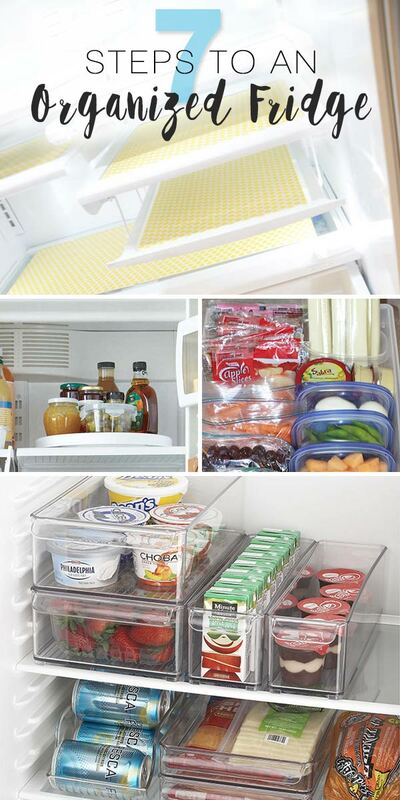 Hope you enjoyed these refrigerator organization ideas. Check out our post on small kitchen organizing ideas. You also might like 10 Ways to an Organized Pantry! Very inspiring! Will apply someof your ideas. FYI… I noticed honey in the fridge door…as a former beekeeper, never store it in fridge. It will crystallize. Of course carefully heating will dissolve them. Remember, honey found in pyramids was still good! I can hardly see any vegetables or fruit. is it me or does it contain mostly processed Stuff in neat sqaure packaging. Some of he comments were unfair. I see leftovers, fresh fruits and vegetables. It’s all there. Never thought of it myself, but great idea to put jars in bins. How many times has something gotten pushed back and spilled all over! Great information! Can’t wait to try some of these ideas in my house. These also look great to try in the camper. I love the lazy susan idea! I’ll be trying that out today. My soda 1.5 l bottles keep falling off the door shelf. Any ideas on prventing their suicidal behaviour? Where did you get those clear plastic tray/drawers in the photos. They seem the perfect size for whatever you had in them. Im sorry, its not our project, so we don’t have the buying info… Sorry we couldn’t be more help! And let’s not even mention the $$ in berries that go to waste! I think a lot of the negative comments comments come from people who don’t like change. I found this article fascinating and I am a family of two – myself and my chihuahua, Toby. To complain about nothing was shown where the leftovers would go is ridiculous. We all have brains but this goes to show you we don’t all use them. You can move the containers any way you want to accommodate a temporary issue. This works for holidays and special occasions also. It is your refrigerator. You can do what you want with it. The refrigerator police are not going to come and arrest you if a bin is out of order. (You may receive a citation. Ha Ha!) So lighten up! It is just refrigerator reorganization. I liked it. I just moved into a new apartment and I plan on using this technique. Thank you for sharing. Haha! This was my favorite rhetort! Couldn’t agree with you more. Everything you said was perfect!! This is one of my favorite articles yet. Thanks for the great ideas. I think that all the pics should be taken as suggestions. Just a way to get you thinking about your own fridge and inspire you to utilize your space to its fullest. Great post! I teach these concepts all the time as an independent organizing consultant with Clever Container. In fact, our current catalog has an opened fridge on the front showing what a huge difference our bins make. It is so nice that to see this concept reinforced in print. I love how you cited many different resources that recommend the same solution to fridge clutter! Thank you!! I got a chuckle out of that “HELP FOR HOARDERS” advert right near the top of the article! Looks, clean and well organized, BUT not practical, and in my home would not stay this way and I don;t have any small children living at home, I would be very upset if it got out of order after buying all the plastic containers (that aren’t all that cheap) and spent that time that it must take placing all items in them. Like it was said in previous posts, where do you place the leftovers or the food that you prepare for the meals. Better yet, what about those Holiday Meals with family and friends, where do you store those? This organization might be put to better use for an extra fridge in the garage when you refrigerate and freeze the things that you buy in bulk. No need to buy containers, just use what you have. I thought the organizing tips were very handy and quite useful. And while the actual food products were not even a point in this piece…I found the snack choices to be very realistic and healthy. Im glad to know I’m not the only one to feed my Children “poisonous snacks” like carrots with humus and yogurt. Not all of us restrict our kids to eating only homegrown organic spinach sprouting from our kitchen windowsills. Great article!! Lots of useful tips!! Thank you!! Plus, this article conveniently gathers together LINKS to the bloggers whose fridges those photos are of! Click on the links and go THERE to gripe about someone’s food choices! were limited to some freezer items. So costly to buy separately. But the Fridge looked wonderful you did a great job. I totally agree. I would like to see how to store an abundance of fresh food and homemade leftovers. However, these packaged goods are organized beautifully, I will admit. It just wouldn’t work for my family. Whoa, first step with that fridge is to get rid of all the processed foodstuffs! Soda? Philadelphia Cream Rubber? Chobani sugary “yogurt”? Those pudding-y things? Processed meats? Yikes! If all that stuff went, then there would be plenty of room for fresh fruit and veggies and leftovers from homemade meals. Stored in glass please, to avoid toxins from plastic containers. Everything here is either factory-wrapped “food products” or put in plastic containers. Either way, not healthy at all. Two thumbs-up to you, Juno!!!! I was thinking the same thing – not a very healthy fridge selection. It may also be easier to stack up pre-packaged food items as they are all the same size, etc. I store a lot of our leftovers in mason jars in the fridge, keep everything in baskets (jams and jellies in one basket, milk products like yogurt and cream cheese in the other)… it works pretty well. Definitely makes it easier to find things. Oh please! Quit w/the criticism about unhealthy food in someone’s fridge! Not your business and NOT what this blog/website was about! 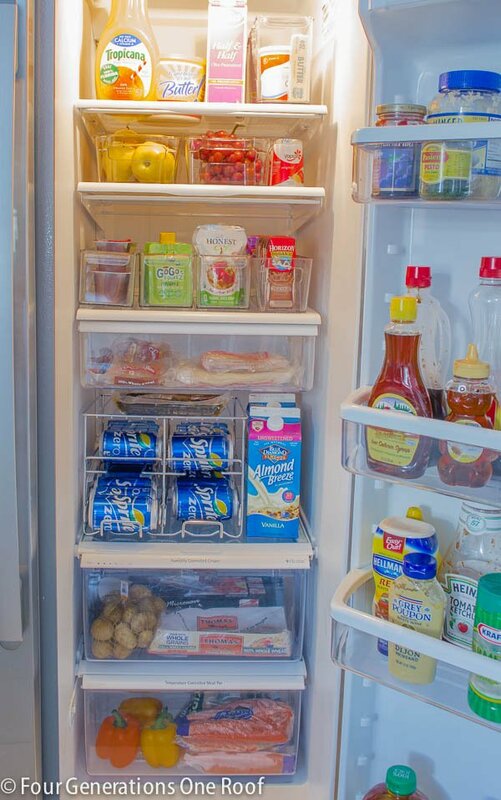 It’s about organizing your fridge…..YOUR fridge, not someone else’s. If you want to get rid of all the processed/toxic/plastic wrapped stuff from your fridge, go right ahead. 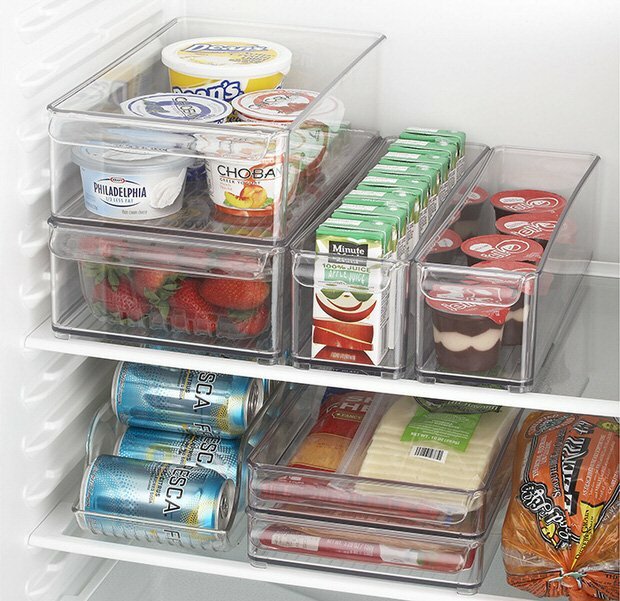 But you can still use the organizing ideas above to organize your healthy, glass only fridge. BTW, is your entire fridge made of glass? What about the fridge itself or the bins that came w/it? Did you replace those? Just asking…..but it’s none of my business, is it? So stay out of other people’s fridge! Crazy people.. So rude ..
Post is about ORGANIZATION, not health food! Exactly it’s about organizing your frig, period! Judge much? This was a post about fridge organization, not about judging each other’s food choices. Some people drink soda. Or seltzer water. Some people eat Chobani yogurt. 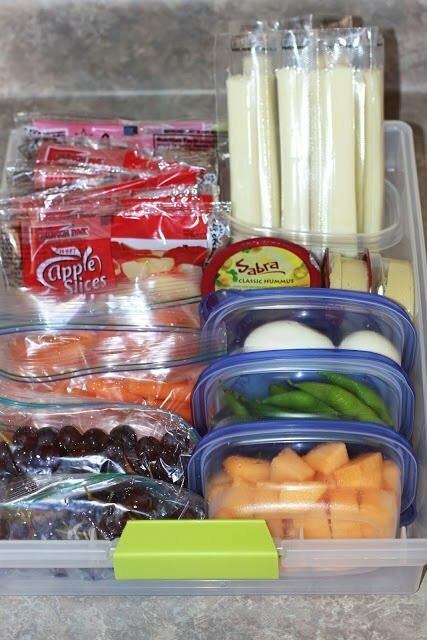 If you went at the judging from a cost basis, you could criticize the individually portioned foods (granola bars, cheese sticks, applesauce pouches) which, while more expensive, may reduce waste and save time or sanity. Leave your judgment at the door and look at the tips for organizing. I agree. In my research, I see many “organized” frigs with no real food. This looks so clean and wonderful. However, I don’t see any leftovers. I cook every meal, and we have leftovers always. I put them in many of the same size containers and stack them on top of each other. I really like the anchor hocking glass storage pieces with sturdy silicone lids and different sizes of mason jars, and create portions out of leftovers for upcoming meals, sometimes freezing them. I haven’t yet tried salad-in-a-jar, but it’s on my list. I designate shelves for the dog, defrosting, eggs, prepared items, water bottles I refill myself (glass), and change the shelf labels as life changes. I have some of those clear plastic organizers that go in and out of use, ditto. But I really enjoy having a organized fridge, and love how easy it is to keep it clean because of containers. It’s true, we almost always forget about the leftovers when organizing our refrigerator. My advice would be to designate an area in your fridge for leftovers only, preferably on top or eye level, and leave this area empty so that you can easily place leftovers there when needed. While leftovers are a rarity in our house, I use to double or triple my family’s favorite meals to reheat when I have no time to cook, or visitors arrive unexpectedly. I’ve solved the food storage problems by buying square and rectangular airtight containers only, and an assortment of resealable plastic bags. Square and rectangular containers, which I use mostly for solid foods, may be stacked to use space more efficiently, and resealable bags serve many different purposes: keep small/single portions of items used sparingly, flat-freeze meat patties, steaks, fish fillets, stock/broth/sauces, and anything I’ll wish to defrost in a snap, or be able to use part of it, without defrosting it all. I use masking tape and a marker to label and date everything that goes into the fridge/freezer; and flat-frozen items are stored vertically in the freezer, both to save space and to find them easily. thank you for you sharing…. Your blog makes me happy and hopeful! I love your writing style, and I can’t get enough of your ideas. Thank you for working hard to get information to the common, unorganized, non-do it yourself ear. I still have a chance! 🙂 the fridge liners will make my fridge smile, and those containers – wow! Back inside to get started!